Paintballing is a popular leisure activity and not without good reason! Where else can you get away with covering your friends in paint? Paintballing is the ultimate messy game. If creating chaos is your idea of fun, you need to get down to your nearest venue! 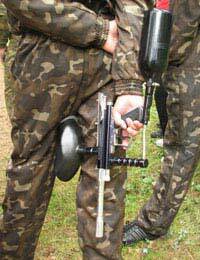 Paintballing involves hitting other players with paintballs (gelatine capsules that explode and splatter paint). If one hits you, you're automatically out of the game, so the winner is the player who lasts the longest without being hit. It might sound dangerous, but experts say it is actually one of the safest sports. Players wear full safety gear (including additional chest protection for women). Games can be played indoors or outdoors. Where Can I Go Paintballing? These are some of the main paintballing venues in England, but don't worry if your nearest town or city isn't listed above, as these aren't necessarily the only places that have the right facilities. There aren't nearly as many paintballing venues in Wales. The main three are located in Cardiff, Shrewsbury (near the Welsh borders) and Anglesey. There are also relatively few paintballing venues in Scotland. The main ones can be found in the major cities of Aberdeen, Edinburgh and Glasgow. What better way to bond with your colleagues? Everyone is sure to let his or her hair down during a paintballing game! You can even invite the clients along, which is sure to be a different way of closing a deal. There are also teambuilding packages and training days on offer to boost workplace morale. Paintballing isn't particularly expensive. The average price is around £20 for a full day package. Package prices are cheaper for children. Depending on the venue, lunch may be part of the package. Some venues may require you to pay an additional fee for safety gear and paint, but they will usually charge less than £20 for day prices, so you shouldn't be too out-of-pocket. Corporate paintballing is generally more expensive. The average cost is around £45 per person. Packages tend to be all-inclusive, so food and drinks are usually included in the cost.